Develop habits to ride & ski smoothly & effortlessly! A wise investment in your skiing & riding future! * each lesson session is 30 minutes. 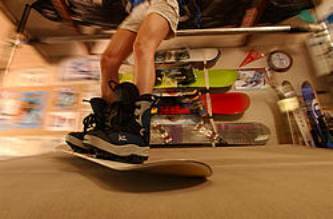 ** Introduction is your very first lesson (60 minutes) and will cover both on the ground and on the Endless Slope lesson. You approximately can make as many turns in a half hour on the Endless Slope as a whole day of skiing or boarding on the mountain. As you perfect your skiing or boarding you can combine 2 half hour sessions to ski and board for an hour. This typically occurs after your 5th or 6th session. I would like to add, “if you are going to practice, practice properly.” This is where proper coaching and lessons are critical to your safety but also to proper development and accelerated successful outcomes. The last thing you want is to establish bad or poor habits through improper training or learning. When it comes to lessons, the more lessons you take, the greater your accomplishment level will be. To ski or snowboard correctly and well has a high entry level that one must overcome. I recommend taking 12 or more session programs that allows beginners and intermediates to overcome any entry barrier. Like any sport it takes proper muscle development and coordination as well as entrenching what is known as "muscle memory." It is not the first 4 or 5 lessons that one obtains the needed skills to ride properly but the last 2 or 3 sessions in a series of 12 or more sessions that one begins to establish the necessary skills as habit. There is no magic formula that makes one a better skier or snowboarder - only hard work through many practice sessions, in the proper environment with the proper instructions. The reward is feeling the ride and mastering the control. The ride becomes you and you the ride. Remember, good skiing or snowboarding is a habit that becomes as simple as walking as your muscles and balance becomes naturally reactive to changing riding positions. If you have to think about it, it is too late. 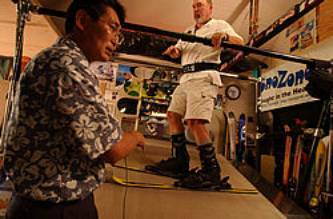 Some experts say it takes a week’s worth of practice or more, of focused practice and repeated repetition to develop just one new movement pattern into a solid skiing or boarding habit. Given the practice time, the right environment and focused instruction, beginners can easily become intermediates and intermediates can become expert. 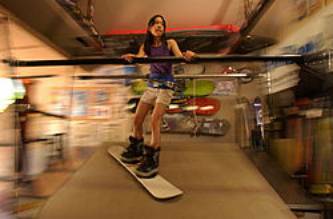 Learning or training on the Endless Slope at SnoZone is an ideal way to establish good skiing and boarding habits and ingrain proper muscle memory. Half an hour on the Endless Slope is equivalent to as many turns as a whole day on snow. Like any sport, a little commitment can go a long way and learning before you go is a smart and safe way to be. The successful ones are the ones who persevere, practicing when they don't want to practice, and sacrificing an easier life for the practice to be better. It all boils down to practice, practice, practice and practice correctly. Give the gift of skiing and snowboarding! - Please arrive 20 minutes before your appointment. - Payment is required when making reservations. - If you cannot attend a scheduled class, please call and reschedule it at least 48 hours in advance. Otherwise, you may forfeit the lesson payment. - All lessons purchased in the season expire April 1st. There are no refunds for classes missed. Lessons are one-on-one and tailored to your personal needs. Your lesson time is maximized for accelerated progress. No wasted time in lift lines because you are constantly skiing or boarding on the revolving slope. You ski or board more in one lesson here than during a day on the snow. Through drills that develop key skills of balance, pressure, steering and edge control, you perform to your potential. We work with you on the components of your technique and remove the mystery of improving. Continuous practice not only allows you to progress but helps establish these skills as habits. Scheduled sessions on a regular basis provide skill development progression that infrequent trips to the mountains cannot match. Your first Endless Slope lesson is also known as your introductory lesson and has a risk free payment term. Within the first 10 minutes of your introductory lesson, if you feel that this is not going to help you, we will gladly refund your money and end the lesson. In such cases it is a free 10 minute introductory on the Endless Slope. This includes usually an additional 10 to 15 minutes on the ground training prior to the 10 minutes on the Endless Slope so actually your risk free payment introductory lesson can be up to 25 minutes. However, if you decide to continue then you will need to pay the full price of the lesson. These lessons are to help you enjoy the sport of skiing and/or snowboarding and if you feel they are not going to do so then you owe us nothing for the introductory lesson. The introductory lesson is approximately 1 hour and all the other lessons are 25 minutes. All lessons are slated for the time slot provided and a late start will have a shorten lesson duration so as to end at the appointed time. Please come early so as to be ready when your appointment starts. * Pricing for on the snow consultations are estimates and varies with the student's situation. Best to contact Sam and explain the need for the consultation and circumstance and a price suitable for all can most likely be reached. 1 On-the-Snow consultations are only performed at locations permitted and authorized for SnoZone. Please check with SnoZone for appropriate locations. Note; Resorts and Federally owned properties may not allow for unauthorized consultation on property. 2 Consultation pricing are same for 1/2 day consultation or for full day (approx. 4 to 8 hours). 3 Endless Slope (ES) students who have had 6 or more lessons on the Endless Slope will receive a discounted price for the "On-the-Snow" consultation. Discount does not apply to lift ticket, transportation, additional away day, accommodations, meal, and misc costs.